The McDonald’s remodeling project at 1820 Pacific S.W. on the afternoon of Dec. 13. The West Albany McDonald’s has been closed for a while for remodeling, depriving me and many others of a convenient stop for a meal. But something else is noteworthy about the project: the city’s fees. According to the Albany Building Division, the owners are remodeling the restaurant to eliminate mansard roofs and replace them with parapets, install new exterior accent walls, supply new interior finishes to the dining area and restrooms, upgrade the access for people with disabilities, and build a new trash enclosure. All this, according to the building permit, is valued at just under $140,000. But the fees collected by the city of Albany total $69,943.97 — half the value of the project. Why are the fees so high? Because they include $62,930 in transportation system development charges or SDCs. That’s the money the city collects from new development to help pay for improvements that growth makes necessary in the street system. But why collect system development charges from a business that’s been in the same place for decades? Well, engineer Aaron Hiemstra of the Public Works Department explained to me, the remodeling also increases the floor space by about 1,000 square feet. And this calls for street development fees to be collected based on formulas set down in the street SDC methodology that’s reviewed and approved by the city council from time to time. The McDonald’s SDC charge was based on the formulas for fast-food restaurants with a drive-through. They’ve had the drive-through forever, and adding to the interior space will not likely raise the number of vehicles going past the windows outside. But that’s irrelevant. The formula is the formula, and that’s it. Well no, not quite. 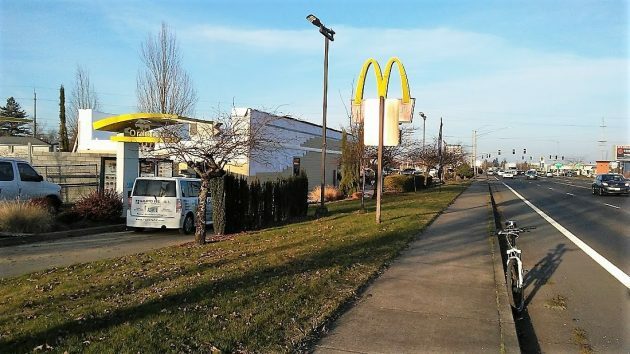 Instead of paying the calculated fee, McDonald’s could have commissioned a traffic study, including traffic counts on nearby intersections and streets including state Highway 99E. Chances are that would have cost more and taken longer than paying the fee. If it looks like a duck, walks like a duck, and quacks like a duck, it is a duck….substitute “sting job by the city” for the word, duck. But what was conspicuously absent from Hering’s screed was any reaction from the McDonalds owners. No angry quotes from cash-strapped Restauranteurs griping about government robbing the business community of all motivation to compete. The McDonalds operators already know what a monstrous cash cow that particular location is. Like good capitalists, they saw a chance to expand and paid the development fees so as to not interrupt the lucrative cash flow. Besides, development fees are just a cost of doing business, all deductible on the 2018 tax form….never mind that corporate taxes are dropping from 35% to 21% under our Make America Great Again president. Spoken like a true socialist…. The reopening will be the 1st or later. Sorry. The owners are lucky that they don’t have to install EV charging stations and solar cells. The storm water fee will go up though. Tony… I know. The very megalomaniacal bureaucrats you refer to, the ones in Washington DC that are about to gve the store away to the Top 1% and to businesses so flush with cash they can’t hardly spend it. They too suffer from money-hunger. It goes without saying, we trust, that when Corporate income tax rates drop from 35% to 21% that a decent percentage of the tax savings will be plowed back into wages for average American workers. Certainly the current occupant of the White House will be magnanimous and generous as he reaps record profit.. It seems money-hungry megalomania knows no bounds. Don’t expect any of the tax reduction to trickle down to the general population, unless they happen to be significant shareholders. I fully expect the largesse to flow toward preferred-share-dividends. They recently added two lanes for taking orders (as is standard now for all McDonalds remodels). By adding interior space it will likely allow faster “food” prep, and thus shorter wait time at the drive through. This can increase throughput and therefore raise the number of vehicles. If interior seating is increased it can also increase traffic for sit down customers as well. The real question here, that will be debated for centuries by physiologists and philosophers alike, is why would anyone in a free society go to McDonalds, when there is a Hasty Freeze, Burgerville, Burger Queen, Wendys, A&W etc nearby? Another option to drive up window is pick up window, without the ordering mic. Customer calls the order in to pick it up thru drive up window. Works for Pizza places. Much much lower SDC rate without the ordering mic. Did you know that the McDonald’s corporation is the largest real estate holder in the world? They operate by owning and then leasing the land to the individual franchise owners. If the franchise doesn’t stick to McD’s rules, they pull the lease from the franchise. I question how much of this fee is actually shouldered by the franchise owner. Seems like they should have any previous “street fees” refunded. just like always—the bureaucrats find a way to stick businesses for their own projects because they are big companies and the money is no big deal. I suggest the owners go to a Council meeting and verbally blast-away. McD’s give jobs to many H.S. students.